Discussion in 'Star Trek - The Original & Animated Series' started by Maurice, Mar 12, 2013. These German soldiers were so stupid! No wonder we won the war... eventually. Klink: Barracks Two was under the direct observation of one of my oldest, most trusted, most dependable guards. Hochstetter: Good, I'm glad it wasn't Schultz. Ah, I didn't recognize them. In fact, I kept getting distracted by how much Comi reminded me of Tige Andrews. William Wintersole, Peter Brocco, Theo Marcuse in The Invaders episode, The Leeches! J.T.B. and CorporalCaptain like this. Anybody who doesn't like Morgan Woodward as walking boss Godfrey... spends a night in the box. Did he ever say a word in the whole film? No, he points or snaps his fingers to communicate. Robert Walker plays an invader in the eponymous series. He freezes the people he touches. He can drink cold beer even in the middle of the desert! Robert Walker played an invader called Nick Baxter that was ill! His touch caused humans to freeze to death, even animals as well! He was on his way to meet a landing saucer but it shot him, thinking he was a human perhaps! Don Eitner also guested as an alien that was pursuing Baxter so that the authorities didn't capture him! 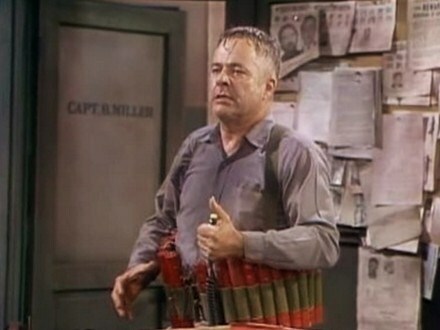 Watching William Windom as a man with a bomb strapped to himself threatening to blow up the precinct on Barney Miller. Yeah, it's really creepy when you see him rubbing the old woman's hands, given that it means her death. The aliens didn't seem to attach much value to life. They'd kill themselves at the drop of a hat. They lacked emotions and had to learn how to pretend to have them in one of many learning centres throughout the country! I think the two aliens pursuing Baxter only wanted to quell public interest rather than him killing innocent human beings! William Sargent, Frank Overton, Philip Pine, Dallas Mitchell in Genesis, an episode of The Invaders!